Revenge Of The Sun is the debut release from InnerSelf (Kristijan Petkovski), a new artist from Skopje discovered by Underground Alien Factory Records. 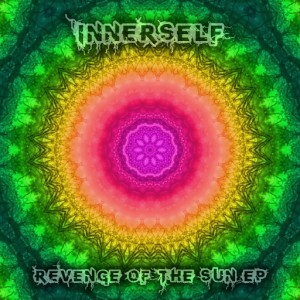 InnerSelf’s music will touch your heart and lift your spirit with sparkling melodic highs and raw psychedelic energy. As with other UAFR releases, this release fits within the new school Goa trance movement, but the specific approach heard here is somewhat darker and more mysterious than usual–perhaps even influenced by forest music and the Glowing Flame style of full-on psytrance. Featuring cover design by Imba and mastering by Psyks Studio. MP3 Download | FLAC Download | WAV Download · Download count: 12,220. Released under a Creative Commons licence for noncommercial usage! Visit the Underground Alien Factory Records homepage for more new school Goa trance releases. chido desde el 97 para aka me late el movimiento y e experimentado viajes indexcriptibles uticizando de vinculo (guia)tu musica bien hecho chido x existir atte el sapo de guadalajara jal. mex. Congratulations to my friend Kiko, very nice music! Your work is unique, and that’s what I really appreciate! Big up man! Great new goa! Keep up. Keep it up excellent Job! Shame that the tracks are suddenly cut on the MP3s I downloaded from the label’s website! Music is good. Vrhunski uradjeno!!! WOW!!!! Goa forever! This is great music. Fantastic, i have no words. This reminds of acid trance as they used to call some pieces when i started with “Goa” in 1993. Its just great, your sound is of very high quality. You have some very very good melodic lines in there. Or better said: You have a theme that you develop in your music, that you make variations of, just great. Best on this site. Go for more, i buy it, better than any stuff you can buy today. Cover art also is awesome. I dont think its “new school”, you are as classic as can be. Im glad you like this release mates. tnx again for good words. I really appreciate! never listen to anybody, do your own thing and continue this great sound, like it very much. this stuff is like from the deep edge of our multidimensional self ..wow comunication perfectione..jus find such stories for us n deliver brother of light….Thaaaank you ! I like this Goa album but it is seems to have a somewhat darker tone to it. The darker kind of Goa is not my favorite but still one of the better ones on Ekto.